BCSDN has published the fourth Monitoring Matrix Regional Report on Enabling Environment for Civil Society Development in Enlargement Countries, presenting the regional state of play of civil society in 2016 and highlighting the priorities for intervention by national and EU institutions at the regional level towards creating a more enabling environment for civil society. 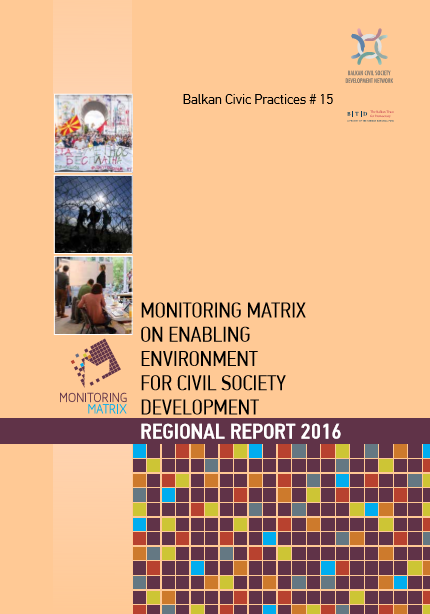 According to the findings for 2016, political crises, elections and economic instability, coupled with increased citizen unrest and the refugee crisis, left little space for civil society development in most of the countries in the Western Balkans and Turkey, despite the relatively stable legal environment. Many CSOs, nevertheless, had pivotal role in organizing peaceful assemblies against political, social and economic injustices as well as actively supporting refugees and migrants passing through the region. The worrisome steps made in several countries in the direction of backsliding and restricting civic space for CSOs and citizens continued throughout 2016. The area of basic legal guarantees of freedoms underwent copious developments both within the legal framework and in practice, with numerous cases of violation being reported. CSOs’ financial viability and sustainability has still not undergone changes in the direction of creating legal frameworks that promote CSOs’ development, and financial sustainability remains to be the most challenging issue in the CSO operations throughout the whole region. In all countries in the region, with the exception of Turkey, there are national level policy documents and mechanisms for cooperation; yet, state-CSO relationships remain to be underdeveloped and not meaningful enough, due to the insufficient implementation of the mechanisms and cooperation documents and the lack of political will to cooperate and respect the established measures. Legal guarantees for freedom of association, freedom of assembly and other related freedoms should be enforced, while the current framework should be properly implemented in practice. Fiscal regulations on the CSO income and tax incentives for donors need to be revised to provide more supportive tax treatment for CSOs, and implementation mechanisms should be strengthened. Public funding mechanisms need to be reformed and their rules properly implemented to ensure relevant, transparent and accountable redistribution processes. Mechanisms for CSO-state cooperation need to be empowered with clear responsibilities and made functional through sufficient allocation of financial and human resources with adequate capacities. CSOs should be regularly involved in decision and policy making processes at all levels, including effective access to information and inclusion in early stages of the process. Involvement of CSOs in provision of services on behalf of the state needs to be increased also in areas beyond social services. The EU to support diversification of CSO financial resources, especially transparent and accountable public funding mechanisms, as well as sufficient public funding. Meaningful participation of civil society in the EU accession processes to be ensured and supported. The EU to support the enabling environment for civil society development within the Enlargement process.